With this wedge-lock designed header bolt, your 1979-1995 Mustang headers will stay tight and free from annoying exhaust leaks! Header bolts consistently tend to loosen over time due to the amount of vibration on your stock manifold or aftermarket headers. With the Proform wedge locking design, loose header bolts are a thing of the past! 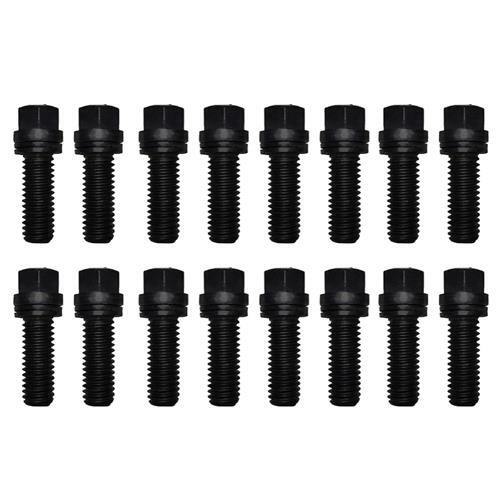 Each one of these 1", Proform Wedge-lock self locking header bolts is permanently assembled with a set of special wedge locking washers! Once each header bolt has been torqued sufficiently, the washers engage the bolt and header flange. During vibration the bolt will try to loosen itself, but cannot because the step shaped teeth between the washers are taller than the bolt can stretch! With a wrench, these steps are easily overcome, resulting in an easy finger loosening.